Please allow time for NBC's "Thank Goodness" video to load. Click the play icon to begin. NBC News recently snuck up on farrier Paul Goodness and his Forging Ahead farrier partnership, headquartered in a lovely old barn in Round Hill, Virginia, in the horse country west of Washington D.C., near Middleburg. The crew's quick little piece on shoeing horses for a filler in NBC's coverage of the Kentucky Derby turned into a news feature on the unique educational setting in this area where the only traffic jam might be between trucks hauling horse trailers carrying some of the world's greatest equine athletes. The greatest athletes...and the lamest, since the Forging Ahead partnership specializes in keeping horses either sound for top-level competing, or bringing them back from every imaginable form of lameness. And sometimes it's a combination of the two. About three years ago, Forging Ahead initiated an innovative internship program for farriers who wanted more than an apprenticeship. Paul Goodness made a commitment to share his 30 years of experience with one or two interns at a time, and they are getting a place to live, a salary, and exposure to a rustic old fieldstone forge that, like a prop in a Harry Potter movie, doubles as a high-tech testing lab for new products and is a launching pad for many new ideas used in shoeing horses and caring for lameness problems. Interns even get to work with Paul in his duties providing farrier services at the Marion du Pont Scott Equine Medical Center, a satellite hospital of Virginia Tech University in nearby Leesburg. You'll just never get Paul to brag about it, that's all. The current interns are Evan Mickle, fresh from completing the Cornell University College of Veterinary Medicine farrier program with Michael Wildenstein and Gwen Nardi. But the NBC piece is not about Paul, it's about the future, which is really what his entire career has been about anyway: making things better for horses, easier for farriers, safer and cleaner and lots less painful for everyone. If the publicity could do one thing for Forging Ahead, Paul hopes it will bring new awareness to the internship program so that people who want to commit to an in-depth program to learn advanced farriery will find their way to Round Hill. Paul completed his own advanced farrier training in a similar program, now sadly discontinued, at the University of Pennsylvania's New Bolton Center, and remembers that there was a long, long waiting list to gain a place there in the 1980s. The future looks bright for Forging Ahead. In addition to Paul, the lineup of farriers working from Round Hill is currently Matt Hatcher, Randy Pawlak, Scott Sellers, and newcomers Zeb Foltz and Travis Burns (who is a graduate of the internship program), plus veteran farrier Scott Brouse recently joined the Forging Ahead roster. Farrier Amy Sidwar is on sabbatical, but still managing the internship program. I asked Paul today how the economy was affecting the practice; Forging Ahead has a lot of mouths to feed. Although he said that his customers were buying fewer new horses, he said that it might work out for Forging Ahead if competitors want to take extra care to keep their veteran campaigners sound through the coming year. "This winter was great, we actually are caught up, maybe for the first time ever," he sighed, but then quickly added that the expanding Florida eventing circuit was more demanding of their services than ever before, requiring at least one farrier to be there at all times. "Things are just right," he said, but then remembered that the top event horses will come home from further south or from competing at the Rolex (Kentucky) Three-Day Event this weekend. "Everything could change next week, once they all get back," he acknowledged. Whatever happens, the interns will have a front-row seat on some of the best action in the farrier world. Click here to read an article about the launch of the internship program. Click here to learn more about Forging Ahead. Click here to learn more about the Forging Ahead internship application process. Update: Since this article was first published in 2009, a few things have changed at Forging Ahead. Randy Pawlak is now on his own, pursuing his career shoeing some of the world's top event horses. Former intern Travis Burns is now Resident Farrier and Lecturer at Virginia-Maryland Regional College of Veterinary Medicine in Blacksburg, Virginia. Read the comments for more news! Just click image to order: $20 per poster; Michigan State University College of Veterinary Medicine and Drs Lisa Lancaster and Robert Bowker for sharing this incredible image! One of the young farriers featured in the MSNBC story on your blog and mentored by Paul Goodness at Forging Ahead is now the youngest woman ever to achieve Certified Journeyman Farrier designation by the American Farriers Association. She is 21-year-old Gwen Nardi, who learned about the internship opportunity through your blog, applied and was accepted. She now is one of only three Certified Journeyman Farriers in the entire Greater Rochester, NY area. Ms. Nardi has been riding since age six and has competed both as an eventer and hunter/jumper. She is a graduate of the Kentucky Horseshoeing School and was the only member of her class to graduate with Highest Distinction. She has just completed a two-year internship under Paul at Forging Ahead. 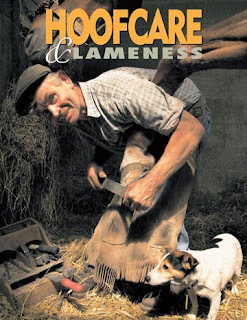 In additional to honing traditional farrier skills to improve comfort and performance, she has trained extensively in therapeutic horseshoeing to treat laminitis and other equine hoof diseases under Mr. Goodness at Forging Ahead and at Virginia Tech's Marion duPont Scott Equine Medical Center. Ms. Nardi is accepting new clients throughout the Northeast and can be reached at gn.farrier@gmail.com. Chronicle of the Horse's Chronicle Connection, dedicated to Women's History Month. And, yes, she was pleased to credit Fran's blog for helping her make that vital connection with Forging Ahead. Her internship with Paul launched her career. Familiar Feet in the Derby Week Crowd?